In Oregon, the state owns all the land submerged in water -– including riverbeds. In a letter sent Friday, DSL operations manager Lori Warner-Dickason told project developers that a portion of their project will be taking place over state-owned submerged lands. That means they will need to lease additional state land before the project can operate. The state land lease requirements from the Oregon Department of State Lands (DSL) apply to both the Port of Morrow, where coal would be loaded from trains to barges on the Columbia River, and Port Westward, where coal would be transferred from those barges to ocean going ships for transport to Asia. The requirements come a month after another state agency, Oregon Department of Environmental Quality (DEQ) informed Ambre Energy that the Port of Morrow proposal would need a 401 Water Quality Certification under the Clean Water Act. Remember that when Ambre asked an independent auditor to assess the deal that would give more control to Ross Bhappu and his private equity fund Resource Capital Funds, the auditor estimated in late 2013 that, despite Ambre executives’ assertions of confidence, the company had just a 50-60% chance of receiving all required permits by its December 2015 deadline. And that was before the news about these Clean Water Act and Oregon state land lease requirements, and based on the auditor’s “discussions with the Company and its management.” I wonder if a conversation between Australian mining executives and financial auditors presents a complete picture of US federal and state clean water protection requirements. Meanwhile, environmental advocates concerned about coal exports in the Gulf of Mexico filed a lawsuit this week against the United Bulk coal export terminal in Southern Louisiana for violating the Clean Water Act by dumping coal and petcoke waste into the Mississippi River “every day that it has operated for at least five years.” The lawsuit, brought by Gulf Restoration Network, Sierra Club, and Louisiana Environmental Action Network, includes photos of coal polluted water spreading into the river. 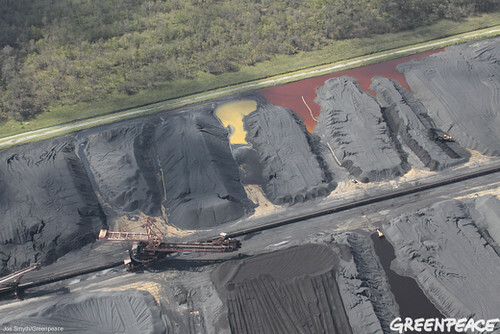 When I documented this United Bulk coal export facility after it flooded during Hurricane Isaac, there were bright red pools of polluted water surrounding the huge piles of coal and petcoke, and another coal export terminal on the other side of the Mississippi was pumping polluted water and coal waste into the surrounding wetlands. 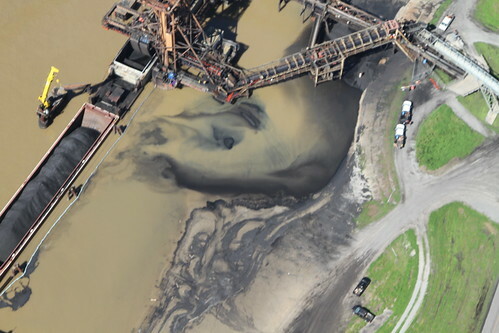 These are the kinds of impacts to waterways that accompany coal export terminals, and are among the reasons communities from Louisiana to Oregon are calling for enforcement of clean water protections and organizing to stop new coal export proposals.